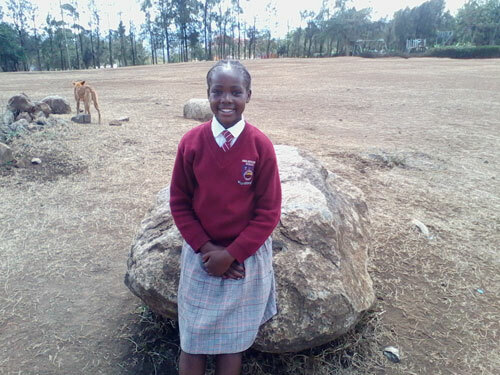 Bold, jovial, bright and hopeful are just a few words to describe this eleven year old girl, Ndulu (pronounced Dulu). Brought to Tania Centre by a caring neighbor, Ndulu was facing a stressful childhood since she along with her brother had lost their father who had been a tailor. As a result, their mother began having mental challenges due to their difficult family situation and she could no longer provide for her children. She and her brother were faced with sleeping on cartons on dirt floor, very little food and were unable to consistently attend school due to lack of uniforms and materials. Shunned by her peers, she developed a shyness that was no good for her self-esteem, her education nor physical development. When she joined Tania in March 2013, it took her some time to adjust to her new surroundings, adapt to the social environment and start performing better in school. It is amazing how fast she has adapted to the new environment and now she belongs! Today, about 18 months since her arrival, you see a young girl thats life has been transformed. Being sponsored has changed her perspective on her future and she has challenged herself to be the best she can possibly be. She has risen from a non-performer to a top performing student in her class and was position 2 in 6th grade in her midterm examinations. The hope in her eyes is evident and her aspiration of becoming a pilot now sounds a bit realistic and achievable. The difference sponsorship to one child can do is immeasurable.